Fall is the perfect time to travel to the Upper Midwest. The explosion of fall colors up and down the shores of mighty rivers and rolling valleys on its own is a reason to take a road trip. Apple and pumpkin patches are in full swing for family fun and delicious eating of fall favorites. Mosquitoes exit the landscape so outdoor fun can be enjoyed without having to take a bath in eau de Deep Woods Off. My favorite part of traveling to this region of the US in the fall though has to do with something in the air. A particular chill rears its head and signals something important beyond snow is on the way. That chill in the air means that it’s time for the stretch run for football in Wisconsin. And nothing goes better with football than having it in a city that creates top notch craft beer, Madison. Before exploring another great brewery in this city that we can’t stop going back to, let’s dive into why (football fan or not) you need to travel to Madison for a football Saturday. 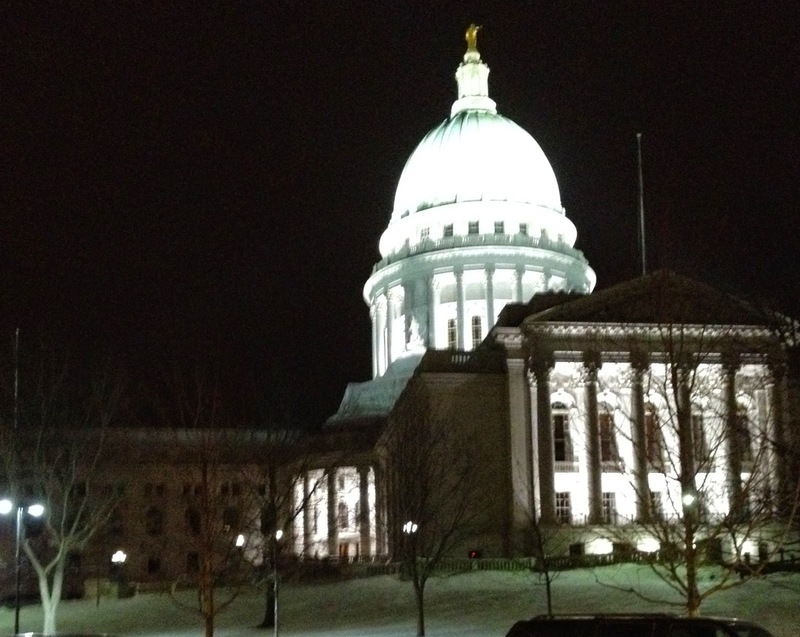 First and foremost, as we’ve chronicled before, Madison is one of the more underrated cities in the US. The city is filled with outdoor activities, unique shops and restaurants, and a real progressive spirit. In the fall the colors are out (and sometimes the snow as well) and fans of the Badgers bring an extra bit of spirit to the city. Football weekends in Madison are 3 hours of football and the rest of the time is spent celebrating (win or lose) Madison. The tailgating scene is not spent in endless parking lots, but in peoples yards or in outdoor beer gardens. The stadium itself is built on a former Union Civil War training grounds and the core of the stadium was erected in 1917. This history and neighborhood fun is great, but the real treat is inside the stadium during a game, again for football and non-football fans alike. There are traditions across the country every Saturday that are bucket listers for football fans, but what you get in Madison is beyond anything out there. From a top notch brass marching band, to in stadium sing alongs to “Buttercup”, to red clad fans “Jumping Around” this Saturday destination should not be missed. Put that together with the gem that is Madison already, and you have one of the great sports towns to travel too. And what makes a football weekend destination even better? AWESOME LOCAL CRAFT BEER!!! And during my last trip to Madison this fall I was lucky enough to take an extended amount of time with the team at the Ale Asylum Brewery. Ale Asylum brews their beer in “sanity” on Madison’s East Side. In 2012 Ale Asylum moved from their original location (which they had only been in for a couple years) to their new location with a full bar and great food menu as well. Why did they have to move? Because the popularity of Ale Asylum’s brews soared right from the start. In a place where beer is king, Ale Asylum finds themselves regularly on lists of the best brews in Wisconsin. Along with this growth in production, Ale Asylum has been able to expand distribution into Illinois as well as Wisconsin. We popped into the Ale Asylum tap room on a Friday night for some pints of the good stuff. The tap room/bar/restaurant is huge compared to other breweries. It’s the size of a solid brewpub, but it definitely is not a brewpub as it is attached to a wonderful brewery and bottling operation. I had never been to the brewery before, though I had had some of Ale Asylum’s brews in the past. The room was comfortable and I was ready to have those pints. The decision making process at Ale Asylum was hard. With 13 brews on tap, I needed a few extra minutes to decide. Since the temperature was nowhere near 20 (yes it was still fall), I wanted a brew to help warm me up a little bit. I dove into the Contorter Porter while my drinking partner for the night (my dad) went to town on a Madtown Nutbrown. Mom was there too but she was under the weather. So the man who influenced me to drink a few good beers instead of binge on swill and I toasted and started. The Contorter Porter was a great choice as it was so rich and the chocolate malt was just what this cold night needed. Some Porters can be a little bitter but the Contorter Porter was smooth as silk. The Madtown Nutbrown was described by my dad as the best brown he’s had and I would put it very high on my list as well. With a blend of 7 malts, you can really get a taste of nut in this brown. Some browns lack in caramel flavor, even though it should be ever present, but this one does not. The brown is a year round beer at Ale Asylum, though on this chilly day it seemed even more appropriate. We moved on to an Ambergeddon and a Hopalicious, a West-coast amber ale and American Pale respectively. Hopalicious is what many see as the flagship beer at Ale Asylum. Hopalicious has become my favorite aggressively hopped beer out there. Unlike other high hop brews though, the hops in Hopalicious are all about flavor vs. bitterness. This beer is hopped 11 times with Cascade hops and you get a hit of all of their citrus goodness. Not to be outdone, our Ambergeddon was hopped to the max as well. Unlike many amber ales, there was bold flavor and even some bitterness at the end. Ambergeddon had a real malty core as well. These 2 beers are what people think of when they think craft beer. There is nothing that any macro beer creates that comes anywhere near what these brews brought to our glasses and that’s why Ale Asylum is in such a positive position in the market. Unfortunately for all of us the Saturday football weekends are over. Fortunately for all of us Madison’s Ale Asylum doesn’t only brew during football season. But if you do want to spend a weekend eating bratwurst and drinking great beer, head to Madison and make sure you check out Ale Asylum while you’re there.